Please have a look at this video to see how this easy yet powerful tool can really help parent's understanding of school life and take control over their involvement with school. There are 160+ information points in the App which were defined following discussions with parents, teachers and looking at lots of Welcome Booklets from schools. Each point is translated into various languages shown below. Schools can add content, make changes, personalise with names and photos to any classroom and take as many print outs as they liked. 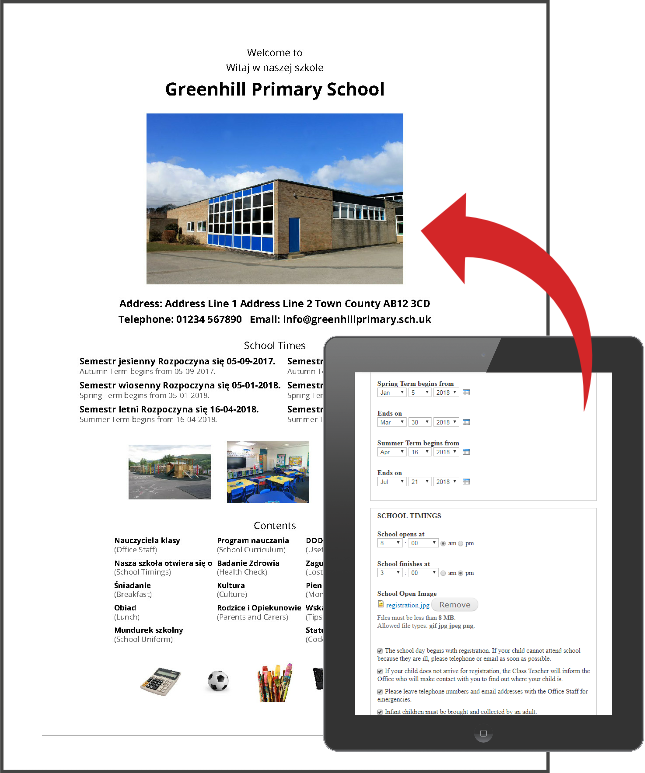 In order to further enhance the link between school and home, schools could also email the Personalised Welcome Booklets to parents, carers and their local communities. The Dual Language Welcome App is suitable for computers, laptops, iPads, tablets and smartphones. English only, English with Albanian, Arabic, Bengali, Bulgarian, Czech, Farsi, French, Hungarian, Italian, Latvian, Lithuanian, Malayalam, Mandarin, Nepali, Panjabi, Polish, Portuguese, Romanian, Russian, Slovakian, Somali, Spanish, Turkish, Urdu, Vietnamese. You do not have to order all languages at once. We will keep a record and remind you where you are on the pricing scale. So, for example, if a student from Romania comes today to your school, you just need to buy the Romanian licence. 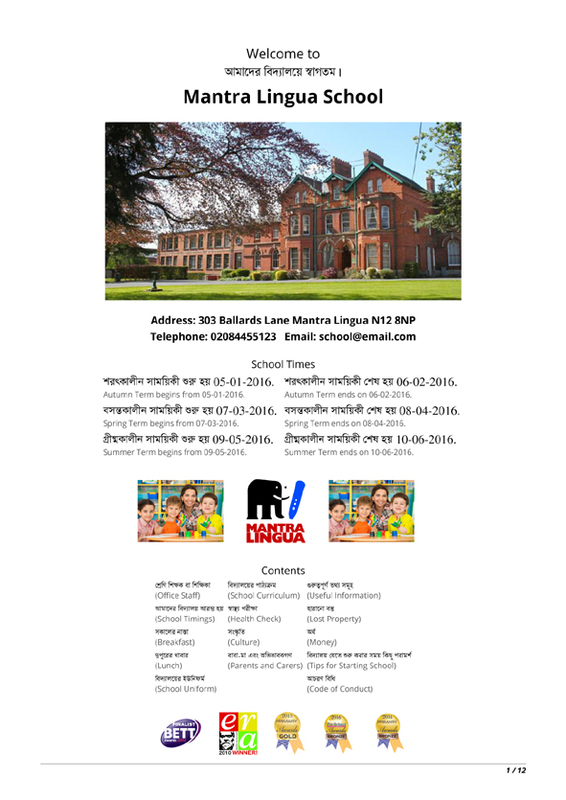 Depending on the number of languages your school has ordered the price could be as low as £5.00! Important Notice: In order to keep prices low, the licences will only apply to bona fide Schools in the United Kingdom. 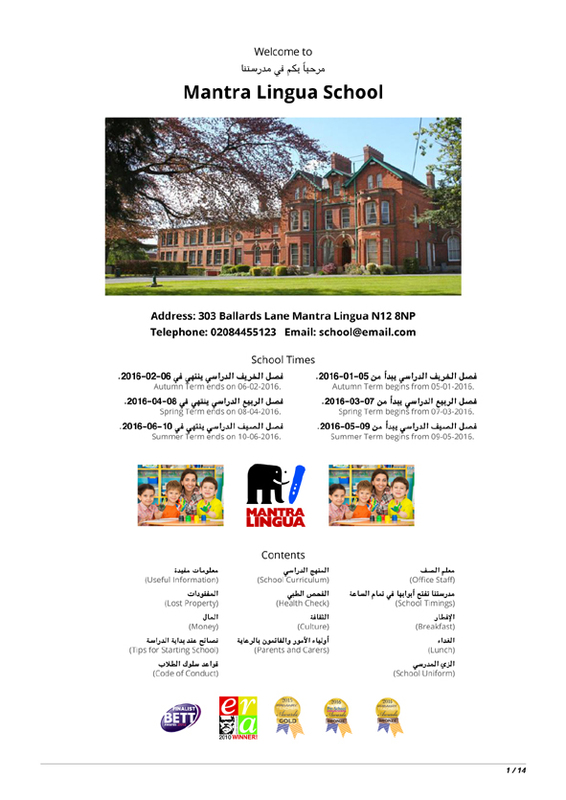 Please email henriette@mantralingua.com or telephone her at 0208 44 55 123 x108 to any questions that you may have. Only official school orders will be accepted. For EAL Advisors we have a special pricing mechanism which Henriette will advise you on. The price will be of the basis of the number of schools that you serve. "I love this! You have so clearly thought about what it is like to be a new parent. There is a clear sense of covering what a parent would want to know..." Erica Field, Rochdale EMA Service.